Ripple Weddings is a team of top quality photographers and videographers who work tirelessly to craft candid photos and films. We’re easy-going, professional and passionate about what we do. Most importantly, we love nothing more than capturing those unseen moments that often go unnoticed in a seamless and candid way. We’re all about capturing your day as it naturally unfolds in the most creative way possible and leaving you with a audio-visual experience that you’ll hold onto forever. It’s a huge privilege to be invited by a couple to document their wedding and it’s not something we take lightly. We take enormous pride in the work we produce and always go that extra mile to create something that truly embodies the whole essence of your day. Since 2014 we’ve delivered over 100+ weddings for awesome couples just like you, and in every unique setting imaginable, so when it comes to shooting this isn’t our first rodeo! We encourage you to check out our portfolio and if our work resonates with you, drop us an email. We’re based on Sydney’s Northern Beaches but love to travel. Once we’ve secured a date, we’ll grab a coffee and get the ball rolling. 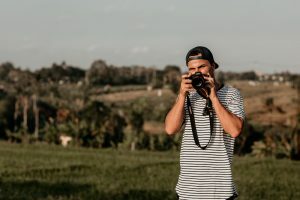 Eddie Blake; Sydney based videographer and photographer whom founded his multimedia, umbrella company Ripple Film, recognised his love for all things digital after completing his degree at Sydney Short Film School. Since 2014, Eddie has since broken into the Wedding industry and been fortunate enough to document hundreds of weddings across his home town of Sydney and around the world. With an eye for candid moments, Eddie and his team at Ripple Weddings pride themselves on capturing moments that naturally unfold and often go unseen; the moments that make your day special. If it sounds like our style is up your alley please feel free to contact us through email, and we can arrange a time to meet. Please note we only shoot a limited amount of weddings each year to ensure the highest quality in each production.